Earth symbols play a vital role in feng shui. Incorporating symbols of earth into the spaces you work, play, and live can enhance this stabilizing energy. There are three iconic feng shui symbols used in feng shui. These symbols can't activate an element but can be used with an earth element, such as a square ceramic object or a kun trigram engraved on a gem. The Chinese character "tu" means earth. You can place this framed or as a calligraphy scroll in the northeast (education) or southwest (love and relationship) sector to attract the earth energies. 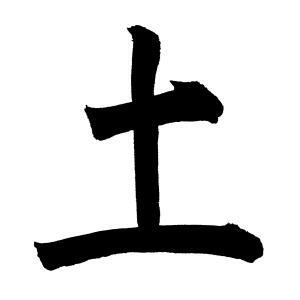 The trigram symbol Kun represents earth. This symbol is found on the bagua for the southwest compass direction. 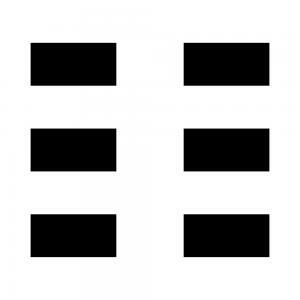 The Kun trigram features three sets of two broken lines stacked on top of each other. The feng shui symbol for earth is the square. 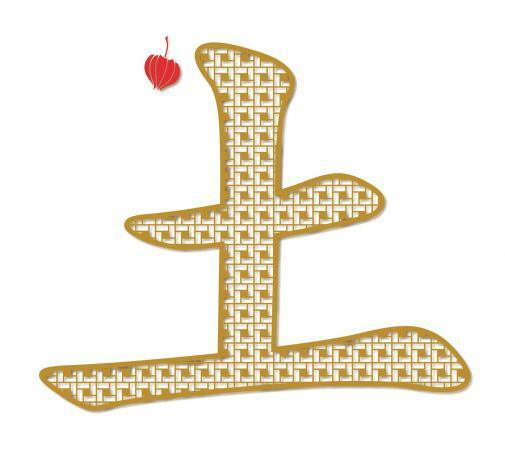 This shape is used for the base for the Feng Shui Compass (Luo Pan). You can use the square shape in sectors ruled by the earth element, such as southwest, northeast and the center of your home. Many cultures and groups have established symbols for elements. These are found in Neolithic cultures as well as alchemical practices. You can always incorporate any of these earth symbols in your home or office by following the feng shui rules of placement. 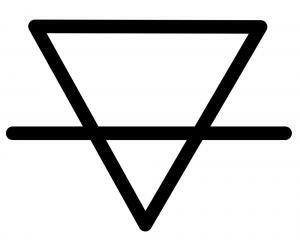 The alchemical symbol for earth is a triangle. This is drawn with a horizontal line intersecting the lower third portion. The triangle is the feng shui symbol for fire In the productive cycle, fire produces earth (ash). You can use the alchemical symbol in the earth sectors to attract earth energy. In ancient times, the old belief that the Earth was flat was countered by Ancient Greek scientists. The Ancient Greeks are credited with concluding the Earth was a spherical shape instead of a flat surface. 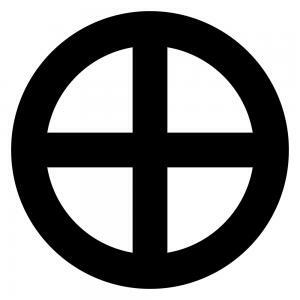 In response, Ancient Romans used a circle for the earth symbol. Originally known as the sun cross, this Neolithic symbol is also used in modern astronomy to represent the Earth. The circle symbol contains a cross inside. In modern terms, the symbol transformed into the symbol for earth. Before you begin adding symbols, you first need to decide which school of feng shui feels best for you, then follow it throughout all of your feng shui practices and applications. You, like the earth and other elements, are composed of energy. Your cells resonate with a certain frequency and your body attunes to certain elements more than others. Luckily, there's more than one school of thought on the topic that allows you to experiment until you find which methods work best for you. You might not have thought about using crystals for earth symbols, but crystals are one of the best symbols as well as activators for earth energy. Since crystals are formed under the pressure of the earth, these stones harness tremendous amounts of earth energy. 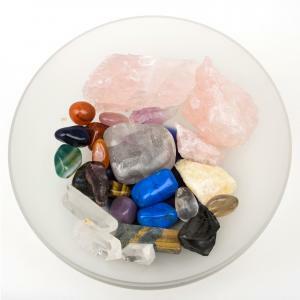 Crystals also have the ability to cleanse negative energies from your home. 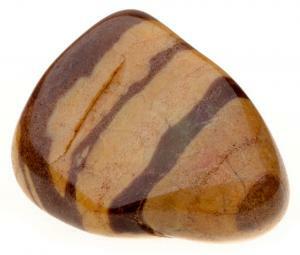 You'll want to select yellow and brown colored crystals for the best results. Another great symbol you can use is the geometric shape assigned to earth energy - the square. This choice may surprise you since it would seem to be the best choice for the earth symbol might be a circle or more aptly an oval. The circle represents heaven. You may be familiar with the mathematical term, "squaring the circle", which is a classic geometry problem. The goal is to solve the problem by constructing a square that's equal in area to a designated circle. In feng shui, the term, squaring the circle is used as a metaphor to express the innate human desire to merge heaven and earth. Many consider this union as the ultimate achievement of harmony. To incorporate a square earthy symbol into your home, you can use cubic art. Decorative boxes and square pillows are another great way to incorporate subtle symbolism. Rocks and stones are also symbols you can use. Pebbles in a vase or clay pot make a good earth symbol. Paintings, pictures and photographs are excellent examples of earth symbols. Landscapes are perfect re-creations of powerful earth energy, which is yin energy. Avoid landscapes with bodies of water for this sector of your home. Black Hat Sect practitioners believe that color can activate an element. If you follow this feng shui school, then you can use color for a symbol. Yellow and brown hues can be introduced into a room. Select the color for objects and accessories. You can also paint the walls of this sector of your home with either of these colors. Just as the earth element does in nature, the earth energy helps create stability and a foundation from which all life can grow. Many Chinese use various symbols as a reminder of how important certain elements and corresponding energies are. This symbolism has found its way into Western feng shui applications. Traditional feng shui practitioners don't believe a symbol can activate an element and use symbols purely for reminders. However, many Western feng shui practitioners, especially those who practice Black Hat Sect feng shui, believe a symbol is powerful enough to transfer energy, attract energy and even activate elements. If you follow Form and Compass feng shui schools of principles, it's the material of the symbol that is important. That means the symbol would need to be made of clay or crystal. In feng shui, the use of pottery, ceramics or crystals represent the earth energy. In the traditional school of feng shui, the symbol design is inconsequential. There are certain values and properties assigned to earth energy. In feng shui, the earth governs agriculture, homes, businesses, food preparation, textiles and earthenwares, such as pottery. Earth energy can restore balance and stability to an unsettled household. You need to be careful when adding elements in your home. You don't want to create an imbalance with too much energy created by the overuse of earth symbols. Symptoms of an overabundance of earth energy can range from a stagnation in growth of your life experiences, to a literal stagnation of indoor plant life. The behavior of family members can alter. It's common for people to become suspicious or act paranoid when there's too much earth energy within the environment. There are many feng shui and other earth symbols. You can use earth symbols to help fortify the earth energy in your home and create a greater stability within your home and family.